The final trailer for Fantastic Beasts: The Crimes of Grindelwald is here. Warner Bros. hyped up the arrival of this new footage for fans and, as promised, they delivered what will be our final big look at the upcoming entry in the wizarding world. This looks like it's going to seriously up the stakes when compared to the first Fantastic Beasts, with the nefarious Grindelwald assembling a following who plan on shaking things up in a dangerously magical way. But not if Newt and Dumbledore have anything to say about it. This is the first trailer we've seen since the full-length Fantastic Beasts 2 trailer made its debut at San Diego Comic-Con. As one would expect, the studio is putting a lot behind this movie. Even though it doesn't feature Harry Potter in the name, this is part of one of the most successful franchises of all-time. Not just cinematically, but looking at book sales and, thanks to The Cursed Child, on the stage as well. Fantastic Beasts 2 looks to further capitalize on the series. But in order to keep doing that, they have to make good movies and that's the key. Fans generally seemed to like Fantastic Beasts and Where to Find Them. However, moving forward, they will need to make these movies resonate more deeply with the fanbase. Bringing in a young Dumbledore is certainly one way to do that. Grindelwald is also an important part of Harry Potter lore who hasn't been fully explored on screen. Despite the controversy that has come as a result of Johnny Depp's casting, fans are finally going to see the dark wizard unleashed later this year. Whether or not we'll actually see him square off with Dumbledore is another thing entirely. This time around, the action will shift to Paris, France. 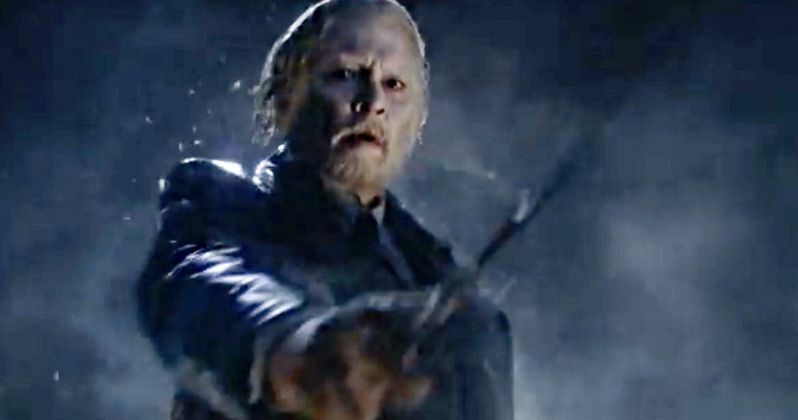 As fans will recall, Grindelwald was captured at the end of the first movie. He manages to escape and Dumbledore, played by Jude Law, recruits his former student Newt Scamander to help stop him before the powerful and evil wizard can do some real damage. It looks like this is going to be a blend of magical creatures, wizard showdowns and spectacular imagery. This will be the sixth movie in the franchise directed by David Yates, who helmed the final four Harry Potter movies and the first Fantastic Beasts. Aside from the aforementioned Johnny Depp and Jude Law, the cast includes Eddie Redmayne, Katherine Waterston, Dan Fogler, Alison Sudol, Ezra Miller, Zoe Kravitz, Callum Turner, Claudia Kim, William Nadylam and Kevin Guthrie. J.K. Rowling penned the screenplay herself and, if all goes well, there will be three more movies in the series, as the author previously revealed she's laid out plans for a five-movie arc. Fantastic Beasts: The Crimes of Grindelwald is set to be released in theaters by Warner Bros. on November 16. Be sure to check out the final trailer for yourself below.